You are currently browsing the The Pet Product Guru blog archives for the day Thursday, March 29th, 2018. The weather is getting warmer which means your dog will be outside more possibly going on long walks or even hikes it you. We need be aware of ticks invading ourselves as well as our best friends. If you live in a region where ticks are found, you should check your dog for ticks after coming in from the outdoors, especially if he has been in a wooded area. Ticks should be safely removed and dogs watched for signs of tick-borne illnesses. Your veterinarian may recommend blood testing to look for tick-borne diseases if your dog is showing signs of illness and has potential tick exposure. 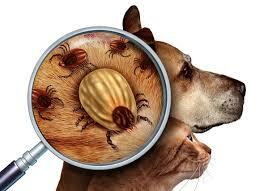 Dogs at risk for ticks should be treated with some form of tick prevention. There are many tick prevention products on the market and new ones come out all the time. Ask your vet about the safest, most effective tick prevention products available. Be sure to use tick prevention as directed. It’s still important to check for tick even if your dog is on prevention. If you start finding many attached ticks, it may mean the product is not working. Thanks to The Spruce for providing some of this valuable information! Keep the oldies playing all the time. The place for all of your oldies plus great popular vocals and standards is Edgewater Gold Radio. Live and local from Rehoboth Beach, De. Turn on your great memories today–Edgewater Gold Radio! Listen on the Tunein app or on our own Edgewater Gold Radio app! add comment Comments Off on The Invasion of Ticks!